Samsung's criticially acclaimed LED-backlit flagship LCD just got an overhaul: The all new Series 9 950 will come in 46-inch and 55-inch sizes, 120Hz motion-blur reduction and a whole bunch of eco-friendly attributes, like paint-free "Touch of Color" and absence of mercury and other toxic chemicals. They will range in price from $3,200 to $4,200, but if the reviews of their predecessor are any indicator, this will be one brag-worthy TV. More details and pics below. RIDGEFIELD PARK, N.J.—(BUSINESS WIRE)—Samsung Electronics America Inc., a worldwide leader in innovation and HDTV technology, unveils the successor to the company's award-winning 81 Series LED LCD HDTV, with the launch of the new Series 9 LED LCD HDTV. The 2008 flagship Series 9, Samsung's 2nd generation LCD HDTV to use LED SmartLighting™ technology, offers consumers the powerful combination of LED and 120Hz technologies, resulting in a 1,000,000:1 dynamic contrast ratio for a crisp, full HD 1080p picture. The Series 9 is also distinguished by Samsung's new addition to the art-inspired ToC™ (Touch of Color™) design – an elegantly patterned bezel with charcoal gray accent. Beyond delivering a superior picture performance with craftsman-like design, the Series 9 gives consumers the freedom to easily access and manage nearly all forms of digital content via the TV through innovative features such as InfoLink™ and WiseLink™ Pro. "Combining Samsung's LED SmartLighting and Auto Motion Plus 120Hz technologies in one high-performance LCD HDTV, the Series 9 LCD represents Samsung's continued focus on advancing the very highest picture quality available to consumers in the current HDTV market," said Jonas Tanenbaum, Vice President of LCD Television Marketing at Samsung Electronics America. As Samsung's second generation LCD HDTV to use advanced LED SmartLighting with local dimming technology, the Series 9 LCD HDTV is able to achieve dramatic contrast levels and express "actual black levels" by completely shutting off a pixel's light source, eliminating the grayish black picture plaguing many LCD HDTVs. Conversely, groups of pixels can be locally controlled to produce more light increasing the brightness of the Series 9's picture when necessary. Furthering the Series 9's ability to show deeper black levels, Samsung's improved Ultra Clear Panel technology eliminates ambient light reflection that may affect picture quality, ensuring perfect picture clarity even in bright viewing surroundings. By enhancing color reproduction level, Samsung's Ultra Clear Panel technology also lets consumers enjoy the detail and vibrancy of colors. Adding to the superior picture quality in the Series 9 is Samsung's Auto Motion Plus 120Hz™ technology that reduces the motion blur caused by fast-paced content. It's ideal for diehard sport fans, avid gamers, and movie mavens alike. Always seeking ways to expand the possibilities of the HDTV, the Series 9 LED LCD also features Samsung's InfoLink™ RSS service, which gives touch-of-a-button access to news, weather, and stock quotes. The Series 9 also plays MP3 music, JPEG photos, and video files stored on memory drives, other digital devices, or PCs with Samsung's WiseLink™ Pro and DLNA technology. In addition to WiseLink Pro where consumers can utilize the USB 2.0 access to display home movies and pictures, Samsung's Series 9 comes with internal flash memory pre-loaded with premium content giving consumers access to a vast library of digital content to enjoy, including high resolution artwork, cooking recipes, exercise routines, children's programming, and games. Connecting to external components such as Blu-ray players and HD Camcorders is even easier as the Series 9 comes equipped with four (1 side, 3 rear) HDMI-CEC inputs to control the latest home theater products using a single remote. Continuing Samsung's line of Touch of Color™ HDTV, the Series 9 strays from the traditional black, box-like bezel for an elegant charcoal gray bezel with a honey-comb pattern. To create this distinctive effect, Samsung uses dual-injection molding technology, a process commonly applied in the design of premium automobiles, to embed color within the material. This technology wraps the bezel with a translucent coating and controls the density of the transparent and opaque material used in the process, resulting in a subtle yet unique look with distinct gray and black gradation. Aligned with Samsung's efforts to combine technological advancement with environmental awareness, Samsung's Series 9 950 LCD features a unique "EnergySaving Mode" that ensures the HDTV is compliant with the EPA's EnergyStar® rating system. 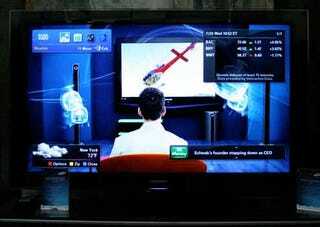 By adjusting the HDTV's backlight brightness with a low, medium, or high selection, power consumption is substantially decreased compared to similar 2007 models. Additionally, because of the unique Touch of Color manufacturing process infuses color into the TV's bezel without any painted on color, no VOC's (Volatile Organic Compounds) are emitted for lower CO2 emissions during production. By using LED backlighting rather than a traditional cold cathode fluorescent lamps (CCFL), the Series 9 950 is also mercury-free. The Series 9 LED LCD HDTVs will be available in August in 46" class (45.9-inch measured diagonally) and the 55" class (54.9-inch measured diagonally) sizes. (Model numbers: LN46A950 and LN55A950).